Many cat owners have had negative experiences when taking their cats to the vets. 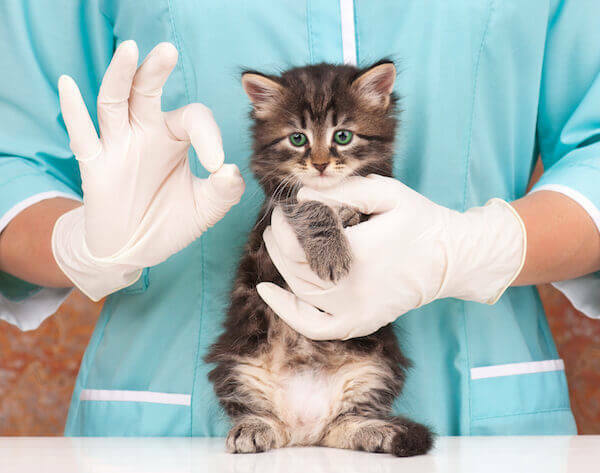 It’s no secret that cats hate being put in unfamiliar situations so it is no surprise that visiting the vet, even for a routine check-up, can be problematic. Fortunately, with some simple preparation and reassurance you will be able to take even the most scared cat to the vet with minimal stress. Before we look at how you can make each vet visit a calm and stress-free experience, it is important to first understand why your cat may find the situation stressful. 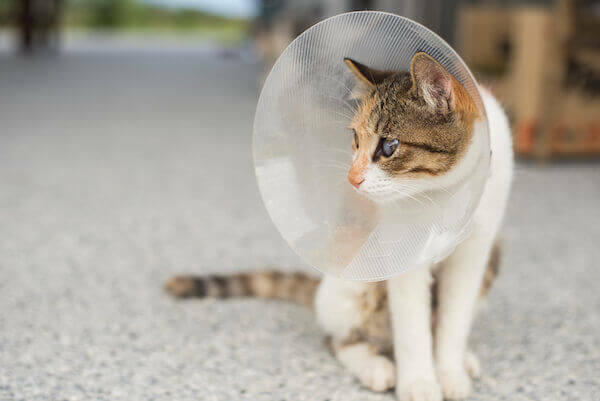 When you visit the vet, your cat is often put through a series of stressful and unfamiliar scenarios before they even reach the veterinary clinic. Many cats only see a carrier when it’s time to visit the vet. This means they associate it with negative experiences and are uncomfortable being in or around it. In order to combat this, make sure you have a carrier that is the right size for your cat and get them used to be in and around it. If you don’t want to have the carrier out all the time, bring it out a few days prior to the vet visit. This gives your cat a chance to go in and out of the carrier and get used to it. Also, placing one of your cat’s blankets into the carrier will help to make it more familiar and less scary. As pet carriers tend to be quite bulky and awkward to carry, you may want to invest in a cat backpack (find out more about what a cat backpack is at Tuxedo Cat) these allow you to carry your cat with ease while keeping your hands free to open doors and fill out paperwork. It also means your cat is kept far from the ground and far from the other animals at the vets. Using a cat backpack may also offer a suitable solution for cats who have had bad experiences with traditional carriers and as a result, refuse to go near them. If going to the vets involves driving, it is best to get your cat used to being in the car prior to the visit. You can do this by putting your cat in the carrier in the car (without going anywhere) for a few minutes, then give them a treat and take them back into the house. Do this a few times to help your cat get used to being in the car. Before long, going in the car will no longer cause stress, then you can do it again but this time turn the car on and get your cat used to the engine. Once this has been normalized you can drive short distances. All the while reassuring and rewarding your cat. Taking it step by step in this way allows your cat to get used to the situation without feeling afraid or overwhelmed. Then when the time comes to go to the vet, they will know that going in the car is nothing to worry about. Now that we have taken the stress out of going into the carrier and the journey to the vets, let’s look at the vet visit itself. A veterinary waiting area will be full of strange sounds and smells and this can be a nightmare for cats – cats are territorial and love their own space so imagine their dread when they are suddenly in an unknown room with various animals, lots of strangers and no way to escape. This situation can be very stressful, particularly when the cat carrier is placed on the ground in close proximity to other animals. It’s something you may not have even thought about before but placing the carrier on the floor as dogs pass by on leads is very scary and intimidating for your cat. If possible, limit the amount of time you spend in the waiting room. If there is a cat-only waiting area, take advantage of this but generally the less time spent waiting the better. If you’re early, you may want to sit in the car for a few extra minutes until the appointment is due. If you are in the waiting area, choose a quiet spot and have the carrier on your lap, continue to reassure your cat in a calm voice to let them know everything is ok. 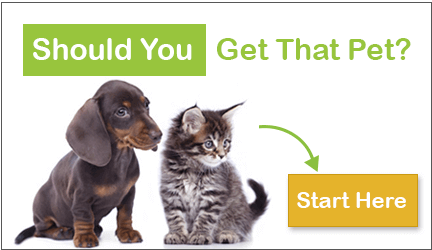 Some vets are more cat friendly than others so it may be worth having a look around to find the best suited practice for your cat. It’s important to reassure your cat throughout the entire journey and vet visit. If your cat likes treats, offer treats at key points such as; when they go into the carrier, at the end of the car journey and in the waiting room. When it is time to be seen by the vet, let the vet know how your cat generally acts during these visits. This allows the vet to decide the best route to take when it comes to physically handling your cat. 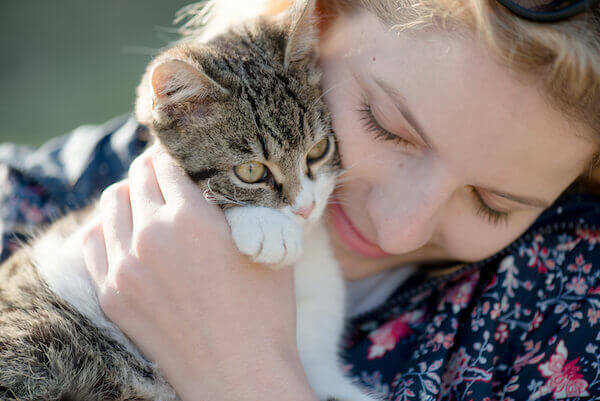 When the vet or vet nurse handles your cat, talk softly so they know you are still there and everything is ok.
You won’t need to worry about trying to hold your cat as the vet or vet nurse will do the handling during the examination and will place your cat back into the carrier when the examination is completed. When the examination is complete and your cat is back in the carrier, offer them a treat and continue to reassure them that everything is ok.
By visiting the vet every now and then with your cat without having any of the handling and procedures it will help to show your cat that not every visit is a negative experience. When you’ve got some spare time, simply pop in to the vets with your cat and give them treats and praise before leaving and going back home. Maybe the receptionist will say hello and give your cat some positive attention too. All of this can help to combat the negative association your cat may have developed around vet visits in the past. If your cat is particularly prone to stress and anxiety, you may find it helpful to use a calming spray such as Feliway to relax your cat prior to a vet visit. You simply spray it inside your cat’s carrier before you leave to go to the vets and it helps to calm your cat. The spray mimics pheromones that cats release when they feel calm so the spray helps to relieve stress. Many people are a bit hesitant when it comes to using sprays but this has been tried and tested and is widely recommended. The Anti-Cruelty Society mentions the use of Feliway when acclimating your pet to the car and state that spraying it onto a towel in the car can help reduce anxiety. Veterinarian Dr. Metcalf also mentions during a radio interview that spraying Feliway onto a towel that you will put into the carrier can help reduce your cat’s anxiety.